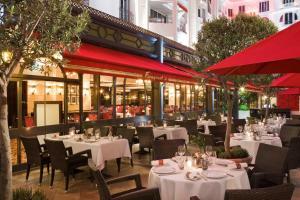 The Majestic Barrière is located on La Croisette in Cannes, next to the Palais des Festivals and Marina. It offers a Spa, casino and an outdoor pool with furnished terrace. The Barrière Cannes offers air-conditioned, soundproofed rooms with satellite TV, Wi-Fi access and a grand private bathroom. Some rooms have a balcony with sea views. Guests of the Majestic Barrière can enjoy massage and relaxation therapies in the hotel spa and relax on the hotel’s beachside sunbathing terrace. The hotel also has a beach restaurant and an on-site restaurant La Petite Maison de Nicole, offering traditional cuisine. Guests can enjoy a drink in the Barrière’s bar and visit the well-known casino. The hotel is situated just a minute’s walk from the beach and 400 metres from Cannes SNCF Train Station. Secure private parking is also available at an additional cost.